Most of the Alpujarras area falls within the Sierra Nevada National Park in central Andalucia and it is a beautiful destination for a warm weather walking holiday in Spring or Autumn. Our self-guided walking holiday is designed to give you a taster of the region, including walking in the wonderful Poquiera gorge and in the off the beaten track area around Cadiar. The Alpujarras has beautiful upland scenery which is home to a large variety of wildlife including the Nevada clover, Nevada violet and Sierra chamomile. Spring is one of the best times to come walking in the Las Alpujarras if you have an interest in wildflowers. There is also a fantastic array of other wildlife to be seen, most notably the Cabra Montes, the Spanish ibex, seen on rocky outcrops, which is a common occurrence and great sight on any walk. As well as wonderful landscapes and a rich flora the region is known for its unique villages and hamlets which have retained their traditional Moors architecture - with white box-shaped houses clustered among the hills. There are more than fifity villages which have preserved their original character and charm. 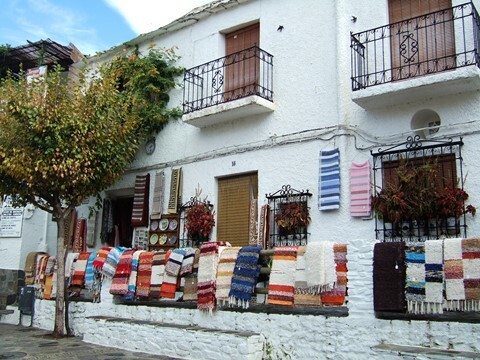 A choice of walks on most days allows walkers of different abilities to enjoy the Alpujarras area. 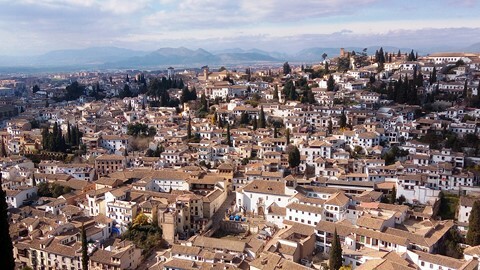 A visit to this part of Andalucia in Spain would not be complete without a day in the historic city of Granada and a trip to the amazing Alhambra palace. This self-guided or independent walking holiday in Andalucia is made up of 7 nights with 5 or 6 days independent walking with 2 days walking between locations and 4 days with circular walks or visits. The majority of walks are at the easy end of moderate with 4 or 5 hours walking with 200 to 300m of ascent. However there are enough options for those wanting longer walks. Choice of walks on all days except the last day’s linear walk which involves 18km and 500m of ascent. Transfer from Malaga if included. Transfer to Capileira - Hotel Finca Los llanos. A briefing of the itinerary for your week's walking. A beautiful walking trail taking in the three villages of Bubion, Pampaniera, and Capileira in the Poquiera Gorge. A choice of two walks either walking out of the Poquiera gorge with some fantastic views of the Sierra Nevada before dropping down into the Taha region (14km 4-6hrs) or a shorter walk but no less beautiful and rewarding (8km 3-4hrs). Walk along the valley side with great views, walking through the villages of Ferreriola and onto Busquistar. Walk past the fountain of health and the Era de Trance. A beautiful walk through the Taha region. Walking on ancient mule tracks you will walk through a varied landscape and visit some of the best unspoilt villages in the Alpujarras region of Andalucia. Checkout of Hotel Mecina transfer to Trevelez and Free day in Trevelez or undertake one of the walks described for Day 6. Check into Hotel la Fragua in Trevelez. Walk down to the Rio Trevelez river which flows all year from the snow melt and the huge aquifers in the Sierra Nevada. Walk along the river for 6km and return the same way. Great level walk along an easy path to follow. 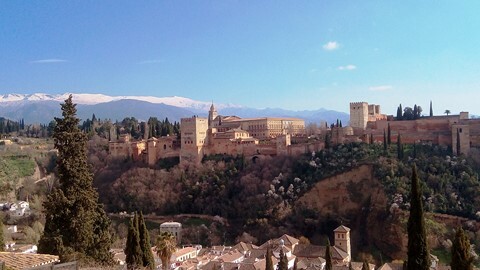 A leisurely walk gradually gaining height above Trevelez and following the valley up towards the Sierra Nevada. An excellent opportunity to spot Golden eagles soaring above you then descend to the valley and follow the Rio Trevelez back in to the village. Gaining 1300 metres in height up to the beautiful arete which holds the siete lagunas (seven lakes). A challenging walk but well worth the effort. A great linear walk from the highest village in Spain down to your beautiful hotel at Cadiar. Another varied day of landscapes and villages. Check out of hotel and departure or transfer to Malaga. Prior to coming on this independent walking holiday in southern Spain, Europe, further information about the walking, the region and what to bring, will be sent to you. We do have a web page dedicated to what clothes and equipment you should bring. In addition, our travel shop has direct access to all the top walking and travel retailers. Please contact us if you need any further information. A variety of charming independent and friendly mainly 3 star hotels or equivalent. A mixture of styles mostly in traditional Andalusian properties. Three evening meals are included in the holiday price. Lunches are not included in the cost of the holiday and can be bought from the services in the local villages. There are a large number of flights to Malaga from destinations from all over Europe by most of the main short haul airlines. From the UK, there are flights from many destinations including London Airports, Bournemouth, Glasgow, Edinburgh, Bristol, Manchester, Liverpool, Cardiff as well as others. Airline companies include British Airways, Easyjet, Iberia, Vueling. Transfers from and to Malaga Airport can be included in the holiday price. Note: Please check concerning the availability of a holiday before booking any flights. If you need further information or would like to discuss any aspect of your travel arrangements, please contact us, we’re here to help you..